We’d love your help. 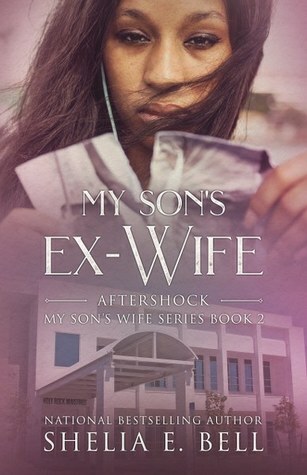 Let us know what’s wrong with this preview of My Son's Ex-Wife by Shelia E. Lipsey. To ask other readers questions about My Son's Ex-Wife, please sign up. Can't wait to read My Son's Next Wife, part 2 was a page turner!! What a turn of events!! A great follow up story!! Shelia releases the next book in the series of "My Son's Wife", which the first installment was a page-turning, frenzy, and on-the-edge of your seat dramatic scenes with a blow at the end of the book that leaves you waiting for this anticipated novel now. After reading the family secrets and dirt unleashing in the first series, "My Son's Ex-Wife" had a different path and opening. It shows redemption, forgiveness, and seeing your own faults (get the peak out of your own eye instead of pointing th Shelia releases the next book in the series of "My Son's Wife", which the first installment was a page-turning, frenzy, and on-the-edge of your seat dramatic scenes with a blow at the end of the book that leaves you waiting for this anticipated novel now. After reading the family secrets and dirt unleashing in the first series, "My Son's Ex-Wife" had a different path and opening. It shows redemption, forgiveness, and seeing your own faults (get the peak out of your own eye instead of pointing the finger at someone else). We see Pastor Stiles walks in his father's shoes and unable to fully release from his mother's apron strings until love stares him in his face, but holding on past love with Rena. Rena held guilty feelings and past mistakes such as STDs clouds her judgment when it comes to a new relationship blooming in her path with Robert. He has a past history but a man who loves her regardless of her past hurts. This is a devoted, good man in her path...women seem to turn these men away even though we all have baggage. This is a sequel which reads like a standalone novel. Rena, Stiles & Frankie have way too many unresolved issues to move forward in life. First Lady Audrey Graham is fed up with the betrayal that Rena and Frankie but its something slightly off about her. A horrible accident changes everyone's perspective of the future. How will things work out? Only God knows the plans He has for them. This is a sequel which reads like a stand alone novel. Rena, Stiles & Frankie have way too many unresolved issues to move forward in life. First Lady Audrey Graham is fed up with the betrayal that Rena and Frankie but its something slightly off about her. A horrible accident changes everyone's perspective of the future. How will things work out? Only God knows the plans He has for them. I slacked alot on this book. It was hard for me to read. It was not as interesting as the first book. The most interesting parts was Audrey's accident, paralysis, and death. The ending was unexpected. I did not expect Rena to let Stiles go. I finally made myself finish. The author should have left it at just 1 book. Unbelievable!!! Just when you thought it couldn't get any better, the Graham family is back! I loved this book just as much as the first one, and anxiously waiting for more on this family. The author has a way with words, so I had to give the book 5 stars. This sequel picks up right where the other one left off (My Son's Wife). Pastor, Audrey, Stiles, Rena and Francesca faith gets tested. This was a good read. I like the author's style of writing. Looking forward to reading "My Son's Next Wife". Renee's mother-in-law and father-in-law find out that she is messing with Franky and her and her husband get divorced. Renee leaves town and when Stiles' father dies, she comes back and they give their relationship a try again. Luv it, can't wait to get my son's next wife. This book was really good. I enjoyed it and I liked the ending. The characters and the storyline held my interest. My Son's Exwife was a marvelous story that conveys the power of God's redemption. Shelia Lipsey did a wonderful job and I look forward to her next book. Dealing with the aftermath of a bitter divorce and finding forgiveness. This book is a page turner. I need to finish this series, because I need to know what's going to happen between Stiles and Detria. I love sequels. This was a great #2 book. Everyone has something in their past, but the mother in law in this story... Predictable read... only because it's like watching Jerry Springer meets Micheal Baisden.